Unique Bright Town-Home In The Family Friendly Bathurst Manor. Close To 1600Sq/Ft Of Living Space + Private South Facing Rooftop Terrace With Gas Outlet - Perfect For Entertaining! Retreat To Your Private Master Suite Complete With Large Walk-In Closet & 4Pc Bath. Hardwood Floors Through Main & 2nd Floor, With A Spacious 2nd Bedroom And Open Concept Den/Office Space. Freshly Painted, Updated Appliances & Quartz Counters - Move In And Enjoy! Ez To Subway! Stainless Fridge, Stove, Microwave Range Hood. Stacked Washer & Dryer. Quartz Cntrs, Hardwood Flrs, Calif Shutters, Light Fixtures, Window Coverings. 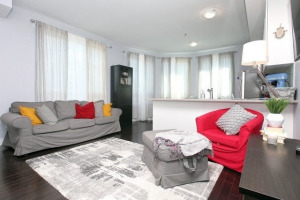 Rooftop, Close To Everything - Subway, Shopping, Yorkdale, Highways Schools, Parks & More!